OHS 3 Star Camp Combo - Stinky Lockers Ltd. This combo features our 3 best sellers. You will receive (1) OHS Big League Stick Label featuring your name, number, logo & team color, a personalized water bottle decal & 1 custom OHS bag tag. Endorse your own stick and turn your stick into a "Big League Stick!" Order for one, the team or an entire tournament! 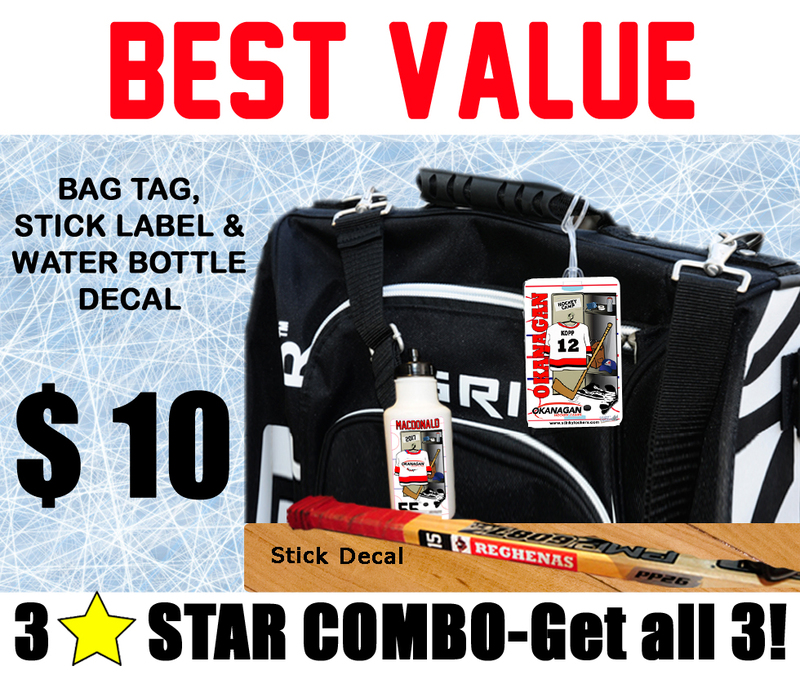 Ideal for hockey, ringette, lacrosse, curling & more! Have you ever left a stick on the bench or dressing room? Changing a broken stick on the fly has never been so easy. Our personalized water bottle labels will ensure no one else steals your drink when you need it most. Peel and stick these laminated and water resistant decals to your existing plastic or stainless water bottle.